Kalhatti Falls or Kalahasti Falls is situated near village Kalhattipurain in Chikmagalur. It is about 10 KMs from Kemmanagundi. Water here cascades from a height of over 120 meters from the Chandra Drona Hill in front of the Veerabhadreshwara temple. 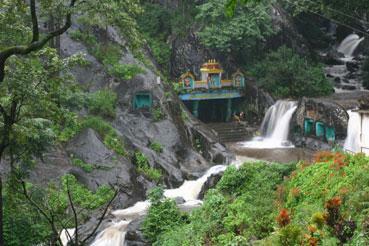 This place is also famous amongst trekkers who climb up to reach the falls. Kalhatti Falls is visible from quite far as well. Bangalore is about 245 KMs from here and Mangalore is 180 KMs.